New York State Department of Environmental Conservation (DEC) today reminded anglers to be aware of spawning lake sturgeon in New York’s Great Lakes waters, Great Lakes connecting channels, and in tributaries of the Great Lakes, St. Lawrence River, Finger Lakes and Oneida Lake. DEC staff receive numerous reports of lake sturgeon (Acipenser fulvescens) caught by anglers targeting walleye at this time of year. Avoid bringing the fish into the boat if possible. Use pliers to remove the hook; sturgeon are almost always hooked in the mouth. Always support the fish horizontally. Do not hold sturgeon in a vertical position by their head, gills, or tails. Never touch their eyes or gills. Minimize their time out of the water and return them to the water immediately once they are freed from fishing gear. Anglers are likely to encounter sturgeon during the spring when the fish gather to spawn on clean gravel or cobble shoals and in stream rapids. Sturgeon spawn in New York in May and June when water temperatures reach 55 to 64°F. Females release as many as 7,000 eggs per pound of fish. Male sturgeon become sexually mature between eight and twelve years of age and may live as long as 55 years. Females become sexually mature between 14 and 33 years of age and live as long as 80 to 150 years. Lake sturgeon populations are recovering as a result of protection and stocking efforts by DEC and several partners. Several populations in the Great Lakes and St. Lawrence River appear to be recovering due to protection efforts. Other populations are supported by stocking. Adult sturgeon are captured in the St. Lawrence River and their eggs and sperm are collected by DEC biologists and partners from US Fish and Wildlife Service at the New York Power Authority facilities below the Moses-Saunders Dam. The fertilized eggs are reared in DEC’s Oneida Hatchery and the US Fish and Wildlife Service’s Genoa National Fish Hatchery to a size of about six inches before stocking. Sturgeon are often tagged as part of ongoing research efforts by state and federal agencies. If a tagged sturgeon is found, it is important to follow the reporting instructions on the tag or contact a regional DEC office for assistance. In New York, visible tags have been placed on lake sturgeon in the Genesee River by the Cortland office of the US Geological Survey and by Cornell University staff from the Shackleton Point research facility on Oneida Lake. Visible tags have also been placed on lake sturgeon in Lake Erie by DEC and the lower Niagara River by U.S. Fish and Wildlife Service. Additionally, some sturgeon in these areas have been tagged with large external satellite transmitting tags. Lake sturgeon are one of three species of sturgeon native to New York. The other two species are shortnose sturgeon (Acipenser brevirostrum) and Atlantic sturgeon (Acipenser oxyrhynchus) which are found in tidal portions of the Hudson River and marine waters of the state. Possession of all three species is prohibited and shortnose sturgeon are listed as endangered in New York State. Atlantic sturgeon are listed as federally endangered in New York. Lake Sturgeon are the largest fish native to the Great Lakes, growing up to seven or more feet in length and achieving weights of up to 300 pounds. Lake sturgeon from New York’s inland waters are smaller on average and may grow to as much as three to five feet in length and about 80 pounds as adults. While once abundant in New York, commercial fishing, dam building and habitat loss decimated populations. Lake Sturgeon can still be found in Lake Erie, the Niagara River, Lake Ontario, the St. Lawrence River, Grasse River, Oswegatchie River, and Black Lake, as well as Lake Champlain, Cayuga Lake, Oneida Lake, Seneca River and Cayuga Canal. While sturgeon numbers have improved, populations are still low compared to historical levels both in New York and the rest of the Great Lakes states. It is estimated that fishing had removed 80 percent of the sturgeon from Lake Erie by 1900. All three sturgeon species were once prized for their meat and caviar and constituted an important industry in the state. Their slow rate of maturity and reproduction made them particularly vulnerable to overfishing. This is historic news. Admin had been keeping an eye out, but was late in posting info! Also a short question & answer page can be found here . Chicago — Delegates for the governors of the eight Great Lakes states on Tuesday unanimously approved the City of Waukesha’s request for a Lake Michigan water supply. On a historic 8-0 vote, Waukesha won the water prize it sought for 13 years. More than a dozen city officials attended the meeting of the states at the University of Illinois-Chicago. Absent any legal challenges, the city will become the first U.S. community located entirely outside the Great Lakes drainage basin to receive a diversion of lake water under the Great Lakes Compact. Reilly said he was grateful for each state’s participation in reviewing the city’s application. “They based their decision today on science and the law,” he said. State delegates focused their discussion Tuesday on a few last-minute amendments to a 12-page document. The document summarizes views of regional officials on the merits of Waukesha’s plan and the conditions needed for it to comply with a 2008 federal law known as the Great Lakes Compact. The compact prohibits Great Lakes water under any circumstances from being pumped beyond counties straddling the lakes’ drainage basins. Waukesha County straddles the subcontinental divide between the Great Lakes and Mississippi River basins, so the city was eligible to apply for lake water. The amendments offered by Minnesota and Michigan were not deal breakers, and they were approved by the states. One flatly states that the city’s original proposed water distribution area extending into four other communities that gained the blessing of the Wisconsin Department of Natural Resources in December “did not clearly meet” all terms of the compact. Conditions added by regional officials last month were intended to achieve compliance. Two of the conditions from the group include: diverting no more than an average of 8.2 million gallons a day of lake water by midcentury — a lesser volume than the average of 10.1 million gallons requested by the city; and a smaller water distribution area than the city proposed. The smaller area would include only the city’s existing water service area, plus several town islands: small pieces of the Town of Waukesha surrounded by the city. An amendment requested by Minnesota emphasizes that individual states or the Great Lakes states as a group can take enforcement actions against Waukesha to compel compliance with those conditions or the compact. Minnesota representative Julie Ekman said last month that she wanted to emphasize there would be another layer of enforcement beyond Wisconsin’s existing authority. A separate amendment offered by Michigan would subject the city’s water utility to performance audits with only 30 days’ advance notice. In such an audit, the city would be required to open its operating records to inspection by one or all of the other seven states. Wisconsin DNR Secretary Cathy Stepp served as Gov. Scott Walker’s delegate to Tuesday’s meeting. Before the final vote, Stepp confirmed the department’s “commitment to and authority to enforce” diversion conditions. Nenn said the regional groups had not decided on possible legal challenges to the diversion approval. Tuesday’s decision requires the city to return 100% of the water pumped from the lake. It will return as fully treated wastewater discharged to the Root River, a tributary of the lake. Waukesha started down a path leading to Tuesday’s decision with several years of studies evaluating alternatives to its primary water supply — deep wells pumping radium-contaminated water out of a sandstone aquifer depleted by more than a century of heavy regional use. Those studies concluded in 2010 by pointing city water utility officials toward the lake as the only sustainable resource available for the long term. 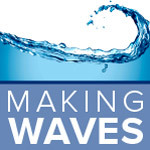 A June 2010 application for Lake Michigan water was followed by six years of review, first by Wisconsin environmental regulators and subsequently by regional water resources officials from the other seven states and Canadian provinces of Ontario and Quebec. Just last month, representatives of seven of the eight states and both provinces gave conditional approval to the city’s request and agreed Waukesha is without a reasonable water supply alternative to Lake Michigan. After imposing conditions restricting use of the lake water, nine of the representatives — with Minnesota abstaining — determined the request would comply with the Great Lakes Compact. “None of the evaluated alternatives were found to be reliable sources for a long-term, dependable and sustainable public water supply,” the group says in a declaration of finding. The Great Lakes Compact required unanimous approval among states participating in the final decision. A single no vote would have killed Waukesha’s plan. Waukesha’s lake water plan would cost $207 million or more to carry out. The city has proposed buying lake water from Oak Creek, building one set of pipelines and pumping stations to divert the water to Waukesha for use and a second set to return an equal volume of water as fully treated wastewater. The next step is gaining state permits to construct and operate the system. Barring any legal delays, it will take six months to a year for the DNR to issue permits and for the Public Service Commission to authorize the city to construct the project, said Eric Ebersberger, deputy administrator of environmental management for the DNR. When lake water becomes available, Waukesha will stop using its 10 groundwater wells, including seven deep wells. The city is under a court-ordered deadline of June 2018 to fully comply with federal and state drinking water standards for radium. The lake water system could not be built in two years, so the city will have to seek an extension of that deadline in court, officials said. When will the tap open? The next step for Waukesha is gaining state permits to construct and operate the system. Barring any legal delays, that will take six months to a year. The city is under a court-ordered deadline of June 2018 to fully comply with federal and state drinking water standards for radium. The lake water system could not be built in two years, so the city will have to seek an extension of that deadline in court. 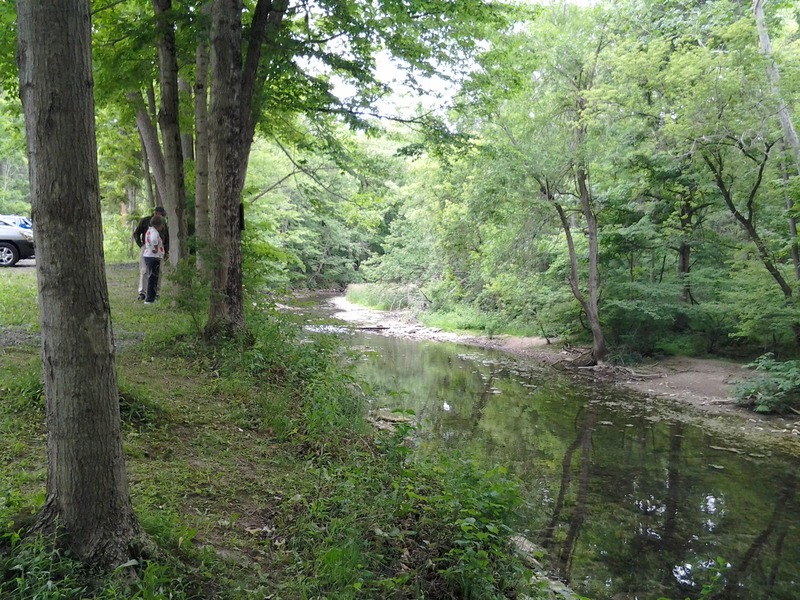 New York Sea Grant in partnership with the New York Department of Environmental Conservation is requesting proposals for projects that serve to benefit the environment and economy of New York’s Great Lakes basin. Project planning, design, and/or implementation, information management tool development, demonstration projects, and targeted outreach and education initiatives are eligible. 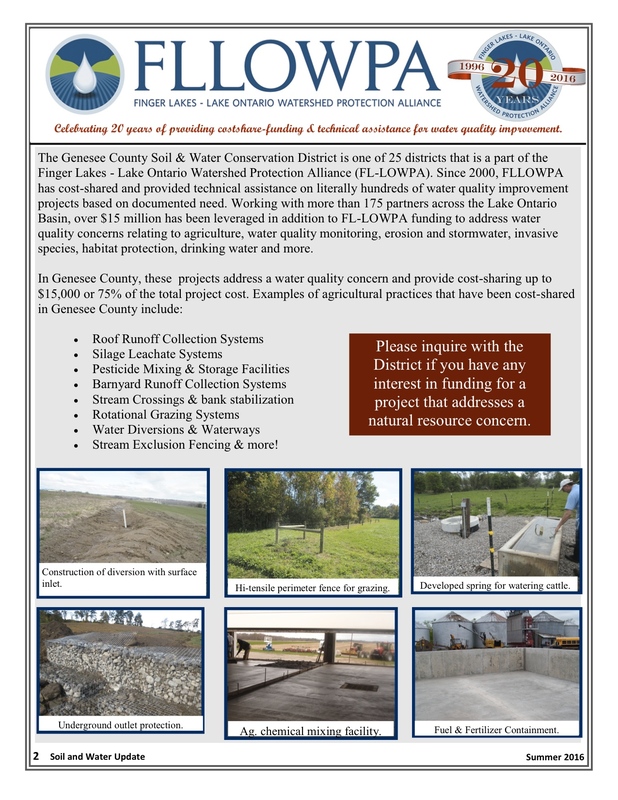 Projects must be located within or be directly related to the Great Lakes basin region of New York. To help not-for-profit organizations, local governmental and public agencies, and public and private educational institutions apply for grants, New York Sea Grant will offer informational webinars on July 11, 2016 at 12pm and July 25, 2016 at 12pm. Those interested in attending may register at https://reg.cce.cornell.edu/SmallGrantsProgramWebinars_112. For questions or more information, please email Heather Weitzner at hw528@cornell.edu. Proposals will be due by September 23, 2016. Grants will be announced the week of October 31, 2016. Full request for proposals and application guidelines are online at http://www.nyseagrant.org/proposals. This small grants program is made possible by the New York State Environmental Protection Fund and Article 14 of Environmental Conservation Law. 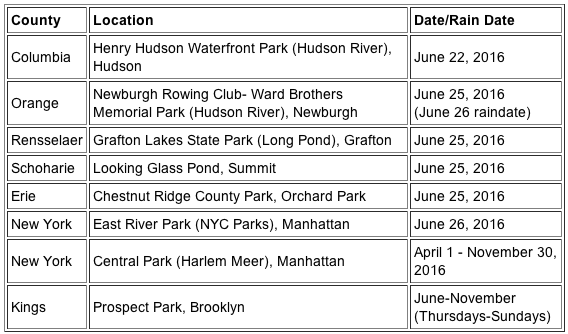 June 25-26, 2016, is Free Fishing Weekend in NY. During these days, anyone can fish the fresh or marine waters of NY and no license is required! It the perfect opportunity to introduce someone to the sport of fishing. At free fishing clinics, participants can fish for free; no freshwater fishing license or enrollment in the Recreational Marine Fishing Registry is required. In addition to fishing, participants can learn about fish identification, fishing equipment and techniques, fisheries management, angling ethics and aquatic ecology. It’s the perfect opportunity to try fishing for the first time. Visit our Free Fishing Clinics webpage for more details on these and other upcoming Free Fishing Clinics. That page is updated constantly as new Free Fishing Clinics are added. Please note there is a local clinic in Orchard Park on June 25! The state has finalized and posted regulations needed to implement the Sewage Pollution Right to Know Act. The Sewage Pollution Right to Know Act requires that untreated and partially treated sewage discharges are reported by publicly owned treatment works and publicly owned sewer systems within two hours of discovery to DEC and within four hours of discovery to the public and adjoining municipalities. Regulation-related documents can be found on DEC’s Recently Adopted Regulations webpage. Visit DEC’s Sewage Pollution Right to Know webpage for instructions on how to sign up for public alerts. The deadline for municipalities to submit applications for the Sewage Pollution Right to Know CSO Grant has been extended until August 26, 2016. Through this grant program, $500,000 is available to assist communities with the detection, monitoring and reporting of Combined Sewer Overflows (CSOs) to enhance compliance with the Sewage Pollution Right to Know Act. Individual grants of up to $50,000 will be provided. Visit DEC’s Sewage Pollution Right to Know CSO Grant webpage for more information. 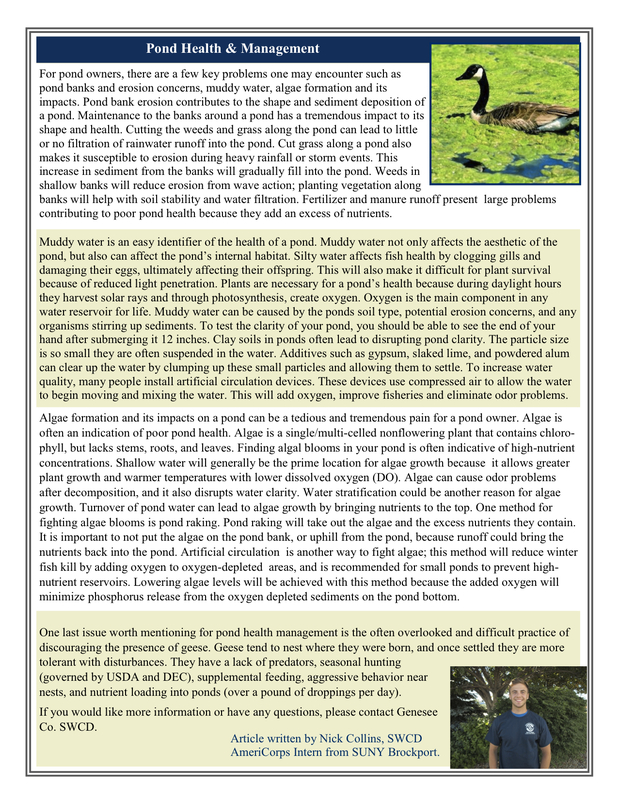 New information about lakes with harmful algal blooms has been posted today, June 17, on the DEC Harmful Algal Blooms Notifications webpage. This week, 13 waterbodies in several locations in the state were added to the notification list. Because waterbodies may have harmful algal blooms that have not been reported to DEC, we recommend avoiding contact with floating mats, scum and discolored water. If you suspect you have seen a harmful algal bloom, or you, your family, or pet has been in contact with a harmful algal bloom, please follow the instructions for reporting a bloom to DEC. If you see it, avoid it and report it! 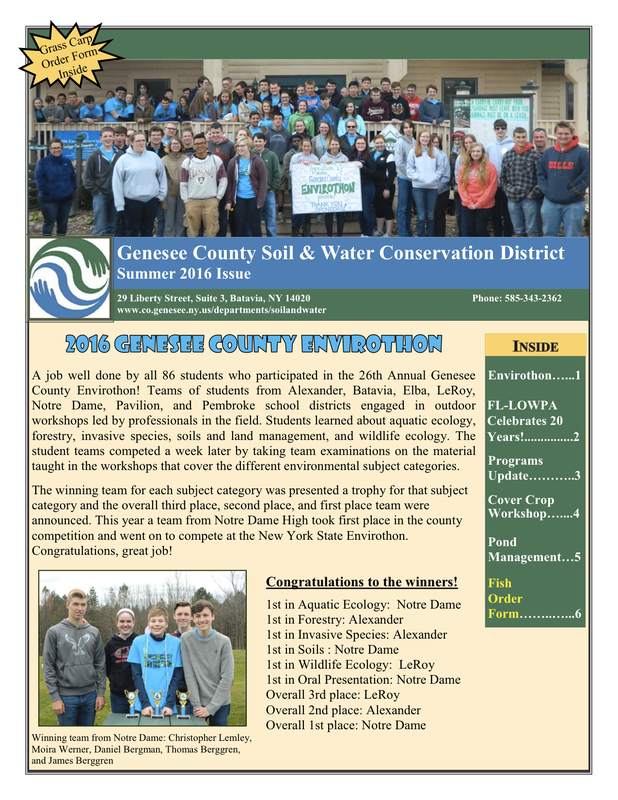 Here is the latest summer newsletter from our friends at Genesee SWCD. 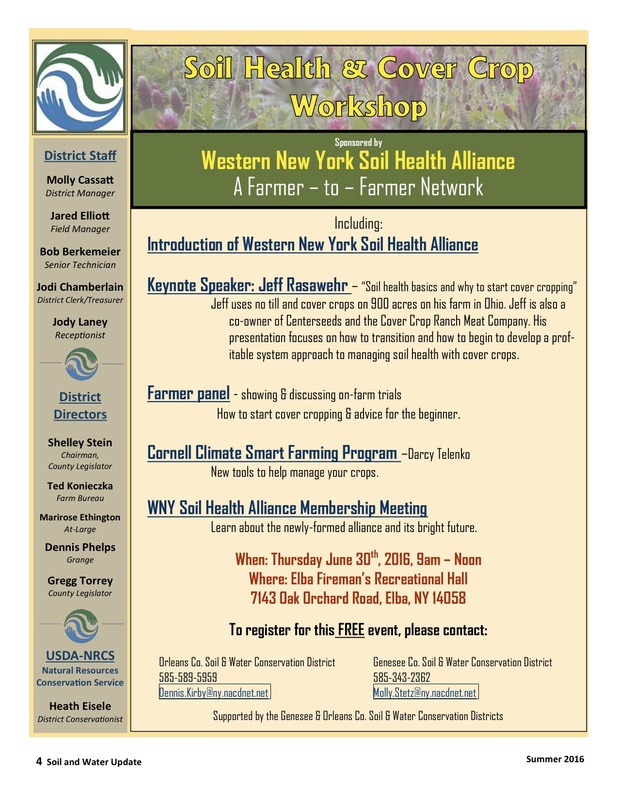 Check out all the news, and note the June 30 FREE Soil Health & Cover Crop workshop! Fish order form is at the end of the post & can be downloaded by clicking on the link. This coming Saturday morning, if you see a small group of folks huddled over the storm drains in LeRoy’s Presidential Acres, it’s just OCWC members figuring out the best techniques for installing storm drain markers. 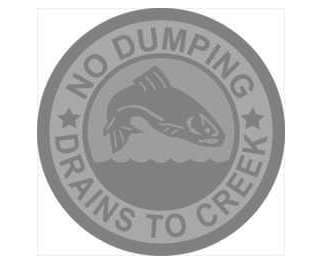 We hope to eventually mark all the storm drains in the Village of LeRoy to alert folks to the fact that what goes down the drain, ends up in the Oatka Creek. Once we figure out the best way to go about installation, we will be looking for volunteers to help us. If you are interested, please contact Pete ! A Picnic and Some Awards! 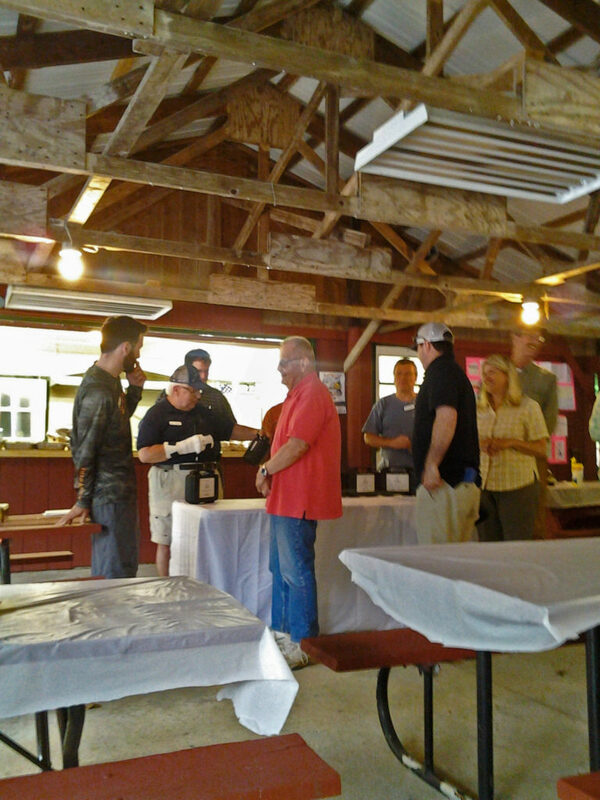 The OCWC was invited to yesterday’s annual chapter picnic of the Seth Green Chapter of Trout Unlimited. 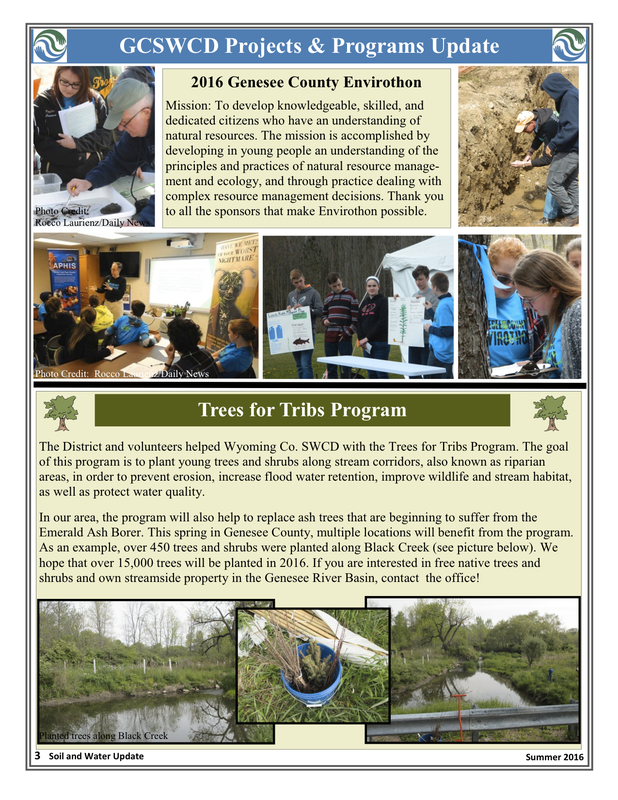 It was very fun, and we got to see some folks we worked with on the Oatka Creek Park tree project, as well as meet some folks we hadn’t had the pleasure of meeting before. 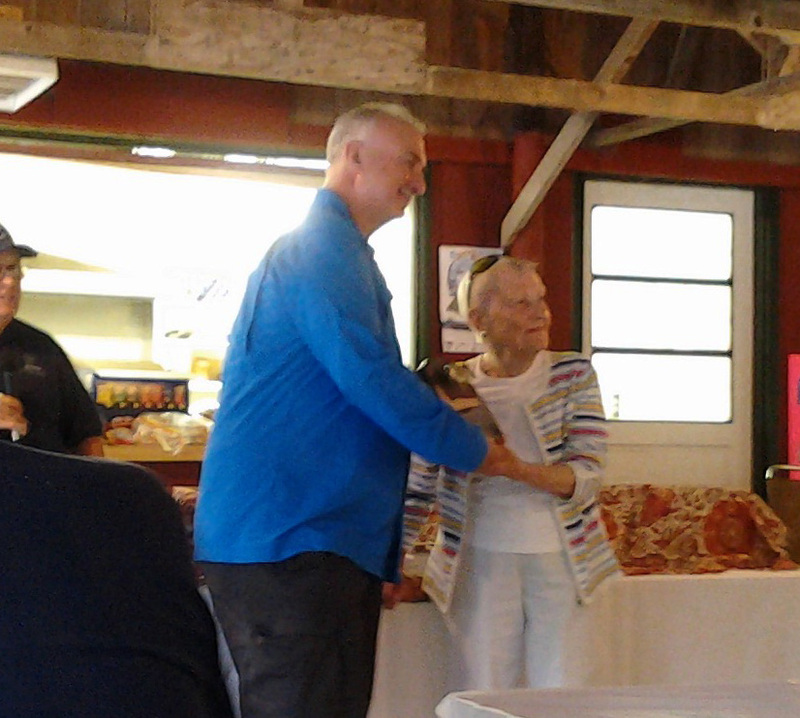 Dave Agness was awarded the John J. Dwyer Coldwater Conservation Award, named for the Chapter’s founder. Dave gave a quick, but remarkable description of some of the efforts in which he has been involved over a number of years. This award is given to people who have, through their long time efforts, created benefits for the natural environment, the fishing community, and society. Alan Mack, who just retired last month from his position of Superintendent of Fisheries at the Caledonia Fish Hatchery, was presented with the “Order of the Baetis” (mayfly) award. Seth Green TU President Larry Charette explained that though Alan was not a member of the organization, the chapter wanted to recognize his outstanding contribution in coldwater fisheries conservation. A few of us even got to taste Alan’s homemade organic wine! TU Directors are also recognized, and Jim Strong was voted as a Director in perpetuity (or was it emeritus?) – anyway, they want him to stay! – You will notice our own Rick VenVertloh on the right! 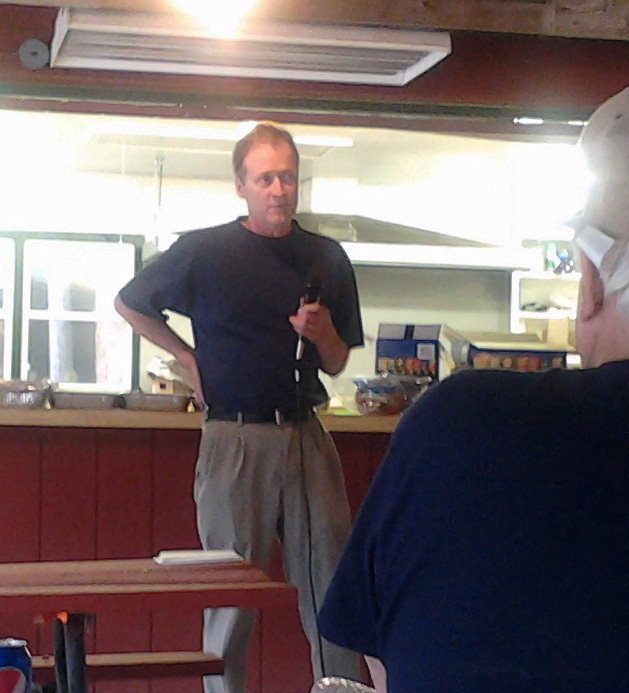 Larry also talked a bit about the Chapter’s accomplishments for the year, and explained that first, and foremost – Trout Unlimited is more than a fishing club, it is a conservation organization that works to protect and restore coldwater habitats. The membership has been growing and he noted that the Seth Green Chapter had the second highest female membership of all chapters in the State! Thank you, Seth Green TU for the invitation! On Saturday we had 9 volunteers helping out. There were four members of the Oatka Creek Watershed Committee, two members from Trout Unlimited, 2 members for the Caledonia Council of Knights of Columbus and one representative from Monroe Co. Soil & Water Conservation District. Our task was to plant the remaining 700 shrubs that were allocated for the project. 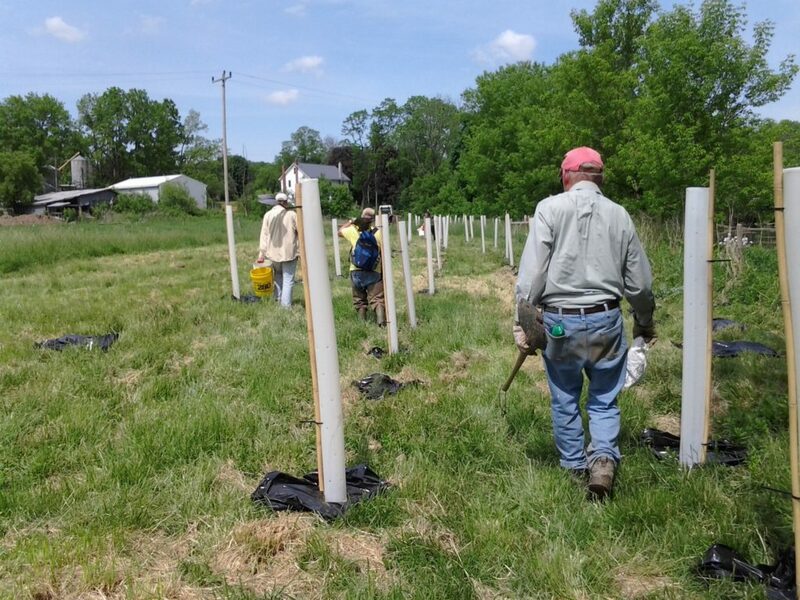 Previously nearly 700 plants were planted on Wednesday 6/1 by 15 volunteers. On Saturday we were able to plant an estimate of 300 shrubs. 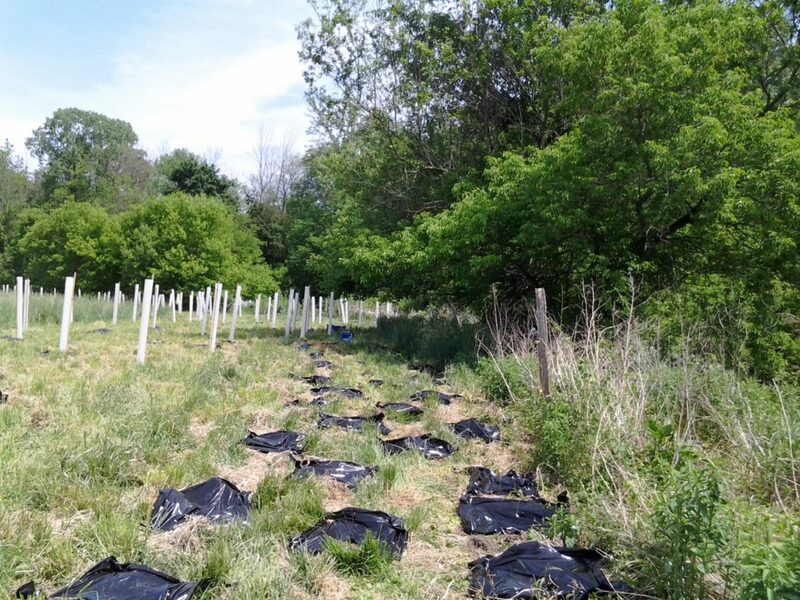 Plants remaining consist of 3 unopened bags of 300 shrubs (2 bags of red osier dogwood with 100 plants in each, and of nannyberry with 100 plants) ,about 50 swamp rose in an opened bag, and about 50 plants consolidated into two 5 gal. buckets. The planting occurred between 9 AM and 3 PM. We had 9 volunteers until noon and 6 stayed in the afternoon. We planted another complete row of shrubs in the mowed area and planted shrubs on the creek side of the fence at several locations. We found that it took longer to plant the shrubs among the existing vegetation on the creek side of the fence, than in the mowed area. Josh moved the bagged shrubs up by the barn. Before we left we consolidated all remaining supplies and plants in buckets to one location in the planting area, but we did not carry these up to the barn ( I guess because we were too “beat”). So the staples, black plastic weed mats, shrubs left in buckets, and other extra buckets will still need to be picked up from the planting area. I want to thank all the volunteers for all their efforts. 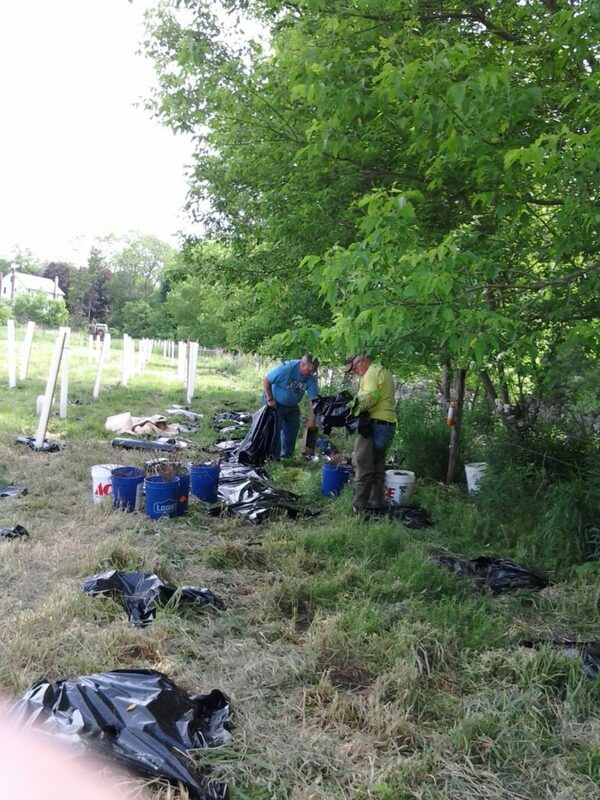 We had fewer volunteers than at Oatka Park, but still managed to plant 1100 plants. I also want to thank Mike and Cassandra Balonek for providing the pizza on Wednesday and the subs on Saturday. Good job by all!! Thank You again ! 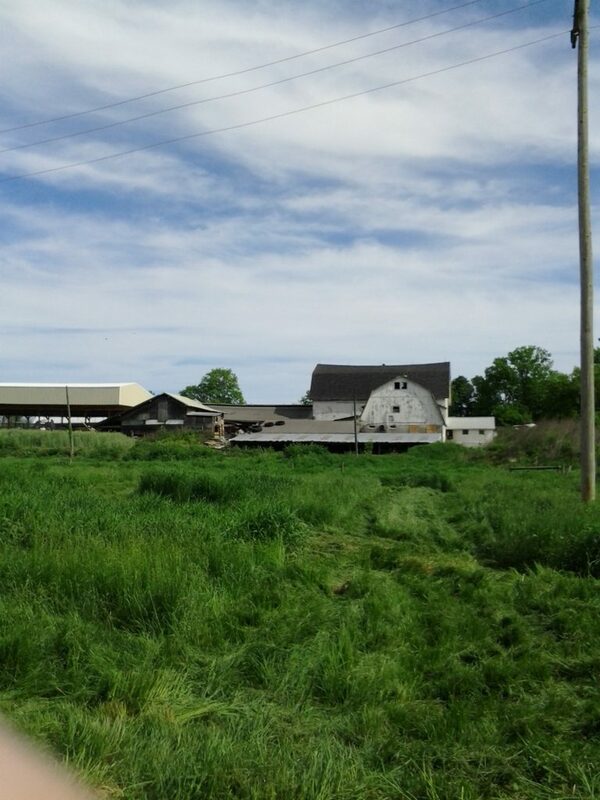 Thank you to our intrepid eight nine that showed up to work on Saturday at the Balonek Dairy Farm! The bulk of the plants made it into the ground – we’ll have a final count when Monroe SWCD folks pick up the remaining supplies. It seemed much warmer today than at the last planting session, as there was more humidity and less of a breeze. Steve, Pete and Don did the difficult work of planting in among the high brush down by the creek. Let’s hope the forecast from the National Weather Service is accurate, and we get the rain that is predicted for the next four days. 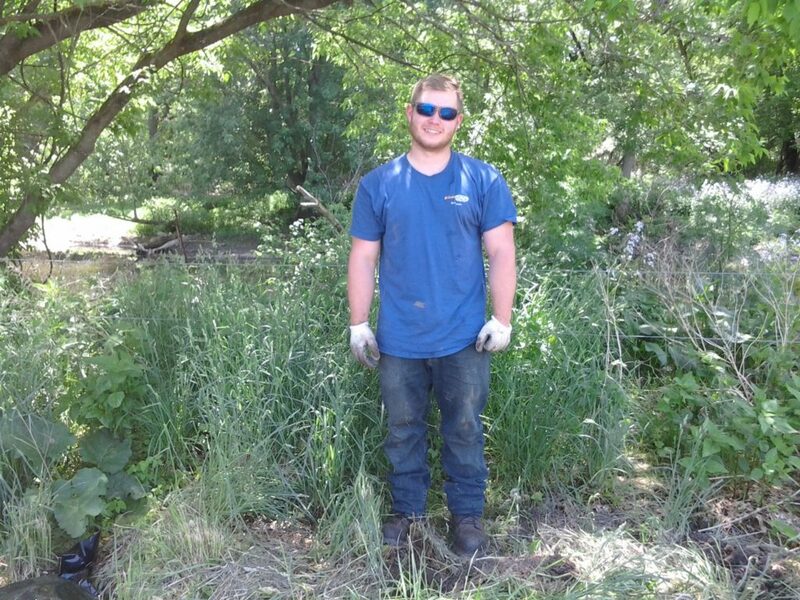 We got Josh from Monroe County SWCD to stand still for a picture. Josh is really really fast at digging holes! We’re packed up and heading home at about 3:30. Again, thanks so much to everyone who helped out. Apparently admin is not good at counting. Thanks to all NINE folks that worked so hard on Saturday!